Our friends hosted an awesome Halloween party this weekend and made a “corpse” from two racks of ribs, onion sausage, a grilled red pepper (for the heart) and a meatloaf head (complete with onion teeth). I contributed trays of deviled egg eyeballs (green ones made with guacamole, black olive irises and sriracha pupils and red ones made with sriracha, green olive irises and black olive pupils) set on beds of black “worms” (Brutus and I boiled spaghetti with food coloring – it was perfectly gross!). All the food was Halloween themed and we had a ball with it! There was a cheese ball with dried beef formed into the shape of a skull. Even the cheese tray was gruesome with red capicola slices, roasted red peppers and pearl onions. I brought this spinach dip which we were going to have coming out of the mouth of a small carved pumpkin but we ran out of time. In hindsight, we should have floated a few plastic eyeballs in it and called 'er done! And, you know, sometimes it’s the simple recipes that are the best. 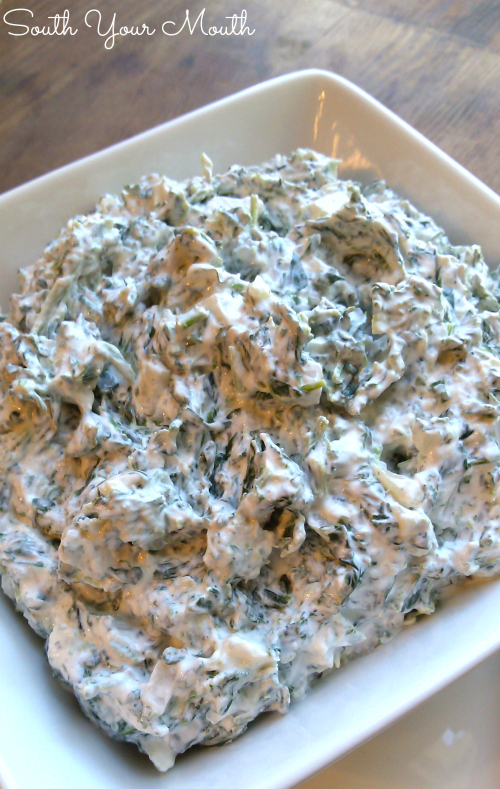 This spinach dip isn't some culinary masterpiece but it’s one of my very favorites. I love any excuse to make this because I absolutely love it and it never fails to get gobbled all up when I serve it. Thoroughly drain spinach. I usually have to wring it out with my hands to get all the water out of it. Add spinach to a medium bowl; set aside. Dice water chestnuts and add to spinach. Combine sour cream, ranch mix, garlic and salt in a small bowl and mix well. Add sour cream mixture to spinach and water chestnuts then stir until thoroughly combined. Cover and refrigerate at least 2 hours. Serve with crackers. I don't have to cook the spinach? No you don't cook it, just thaw and squeeze water out of spinach. How long would the made dip last? It keeps for a week to 10 days. Hmmm... If you saute it a bit to wilt it down then let it cool, then it might work. Give this a try to drain the spinach: put it in a glass pie plate and place another on top (like a nest). Hold them tightly, tilt sideways over the sink and squeeze the plates together as hard as you can. This gets the spinach drier than anything I've tried although it is more cleanup.